For many hard-working people, Thursday is just another day that puts the weekend at arm’s reach. But if you’re a Lincoln, NE, resident, you can give this drab day a fun ending by visiting Buzzard Billy’s. Every week, this restaurant hosts “Crappy Beer and Trivia Night” as a way to treat their guests to cheap drinks and delicious, low-priced appetizers. Read on for more details about this exciting event. Whether you’re a modern history buff or have lived through the wildest years of American culture, you can show off your smarts by joining in on ’60s and ’70s trivia. Entry is free, and questions touch on a variety of topics—a perfect arrangement for a fun night out with your group of friends. If your team knocks it out of the park, you may even win a few cool prizes! Just show up early since the games start at 7:30 p.m. While trivia can certainly get your blood pumping, the event wouldn’t be complete without a tall cold one. 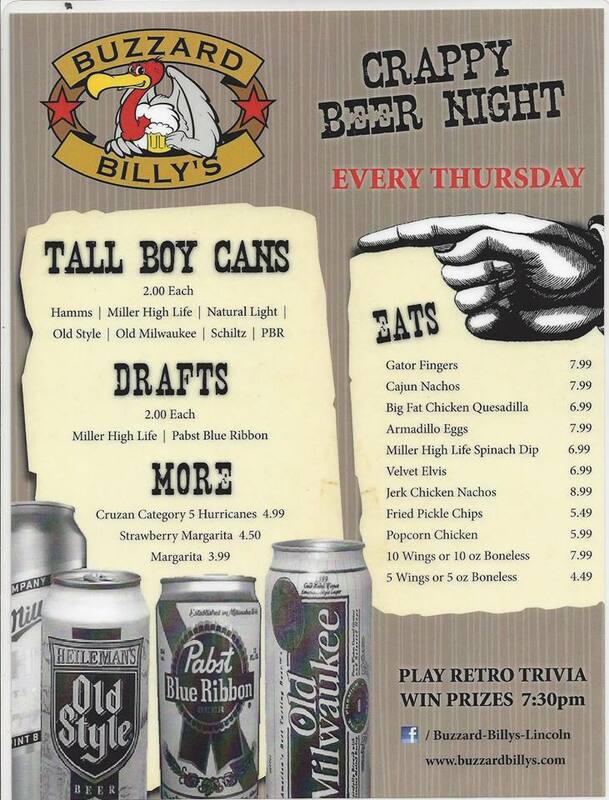 Celebrating the “crappy beers” everyone knows and loves, this restaurant offers a variety of classic tall boys for just $2, including Natural Light®, Old Style®, Old Milwaukee®, and Pabst Blue Ribbon®. If you prefer something straight from the tap, you can also enjoy $2 Miller High Life® and Pabst Blue Ribbon draft. If you want to elevate your drinking experience, Buzzard Billy’s also serves an assortment of discounted cocktails for the evening, such as Cruzan® Category 5 Hurricanes for $4.99, strawberry margaritas for $4.50, and house margaritas for $3.99 each. As you and your crew answer tough questions, you’ll likely work up an appetite. Fortunately, you’ll be in one of the best restaurants in Lincoln. If you’re looking for something to complement your burger, steak, or soul food dinner, Buzzard Billy’s offers a wide range of tasty appetizers for a low price, including armadillo eggs for $7.99, 10 Buzzard Wings for $7.99, Cajun nachos for $7.99, jerk nachos for $8.99, and gator fingers for $7 each. Located near downtown Lincoln, NE, Buzzard’s Billy is a convenient place to stop after a long day. For more details on the restaurant and the cuisine they offer, check out their online menu. If Thursday nights don’t work out for you, you can also call the team at (402) 475-8822 to reserve a table or banquet room for a fun night out any day of the week.